All transactions are safe and secure with a reliable history in online purchasing behind each of our associates. Buy the It's Always Sunny Flipadelphia t-shirts to own It's Always Sunny in Philadelphia clothing and merchandise. Prepare yourself for the Always Sunny Flipadelphia flip cup tournament. Ten years ago the gang was banned from the flip cup competition after they poisoned their rival bar. The ban has since been lifted and Mac, Dennis, Dee, Frank and the rest of the crew are free to reenter the flip cup tournament. If you like to play the game, these Flipadelphia It's Always Sunny in Philadelphia t-shirts will represent your team well and soak up your beer too. 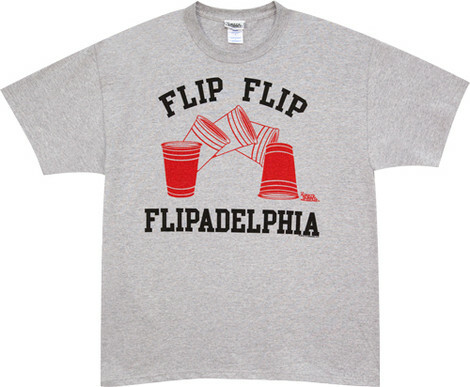 Wear them to utter drunken quotes from Always Sunny as you dominate your own flip cup Flipadelphia tournament. In addition to the It's Always Sunny Flipadelphia tees above, browse the It's Always Sunny in Philadelphia Clothing Gallery for more apparel like men's and women's clothes, kids shirts or hoodies.